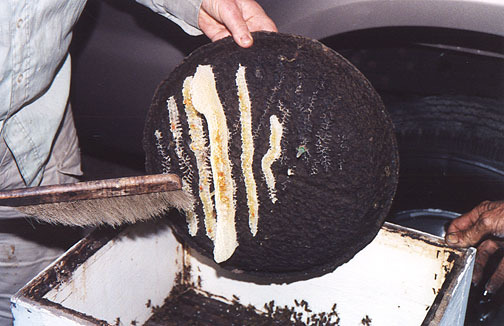 This hinged frame, that opens like a book, is designed to allow easy capture of feral comb that can then be placed into a conventional hive. Designed by Dee Lusby, it’s basically a split frame that is wired on both sides to hold comb in place. 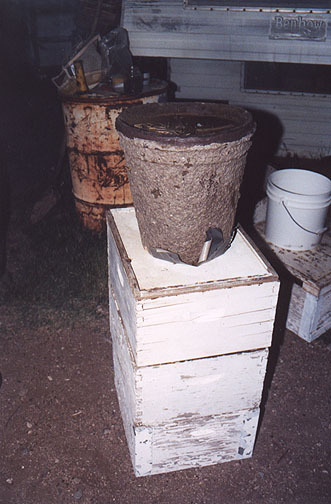 Once filled, the ends of the top bar are wired together and placed into a hive. Here Dee has opened up the swarm trap and is beginning to remove the bees and comb for transferring into standard deep super bee equipment. All of this being done by flashlight. 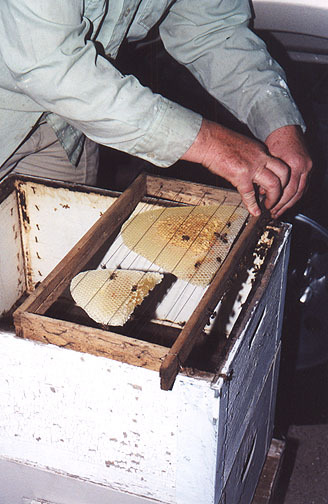 Since bees do not fly at night and rarely sting, Dee merely flips the swarm trap cover, turning the bees and combs upside down, and starts cutting off comb and bees for mounting into ready made swarm catching frames using a Swedish hive tool. 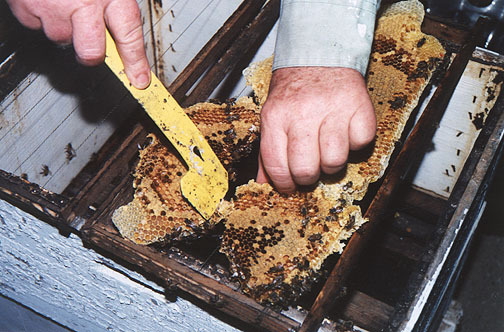 Each piece of brood comb is laid on top of the wires and fit like a puzzle till the frame is full, at which time, the hinged frame is closed and wired shut, trapping the comb between the wires. After closing the swarm catching frame together like a book, Dee simply twists a piece of wire around the top bar ends to hold in place. 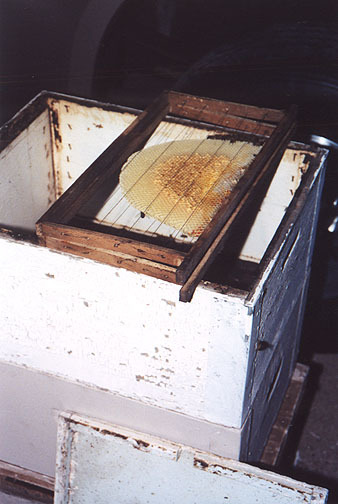 Brood comb in swarm catching frame. 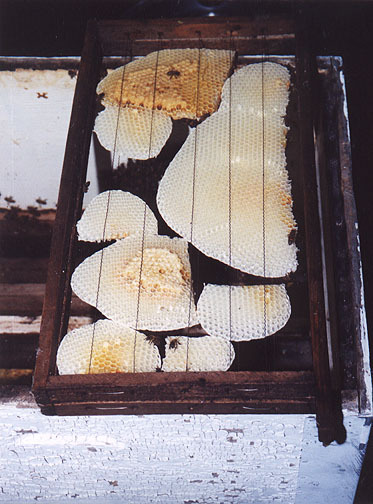 All different size combs in swarm catching frame. 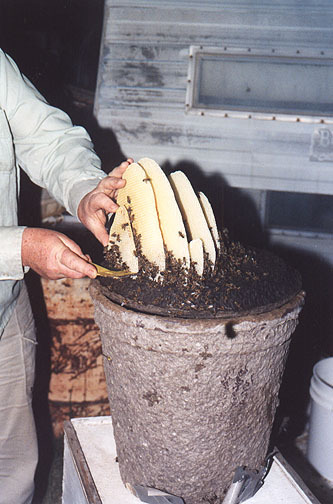 The bees build comb to tie them all together quite nicely. 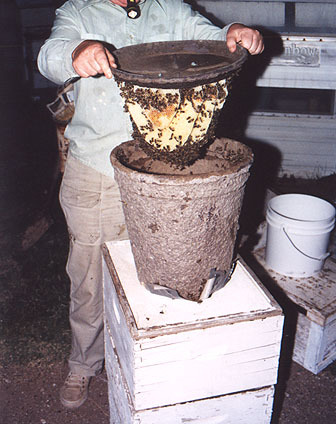 Dee is placing the swarm frame with comb into a standard deep hive body. 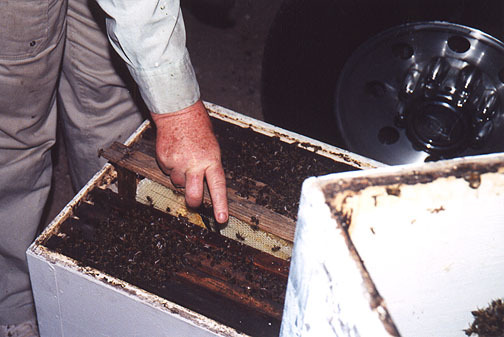 The last remaining bees are brushed off into the new hive and the swarm trap lid will be placed back on the base, leaving the small amount of comb as an attractant, and given back to the owner to be used again. Notice the small vial (center right) that holds the pheromone.